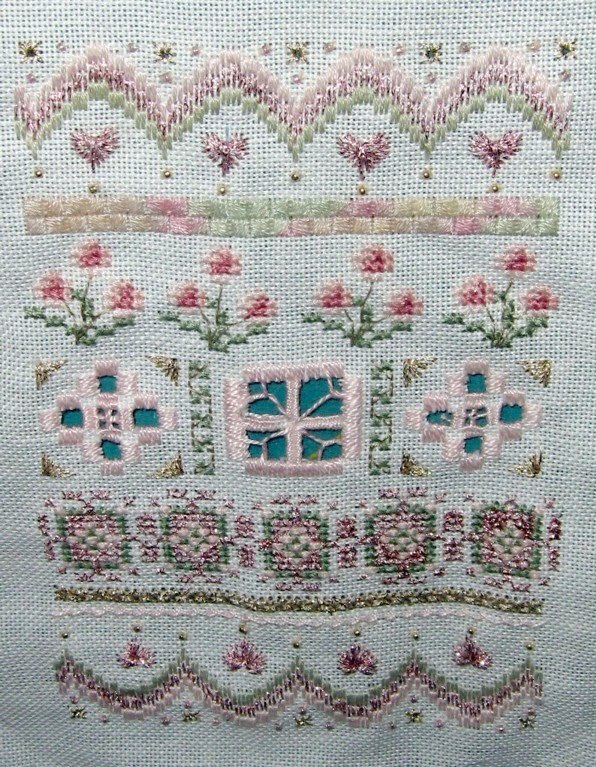 This summer I've been trying to catch up on Unfinished Objects -- embroidered ones. 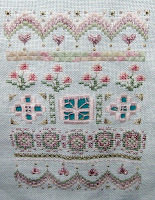 The first was a small "Springtime Sampler" from a long-ago cyber-class over at The Victoria Sampler. In fact, the class was so long ago, that this one isn't even in Thea's cyber-class listings any more! I've managed to find a frame, and have hung it in my bedroom. 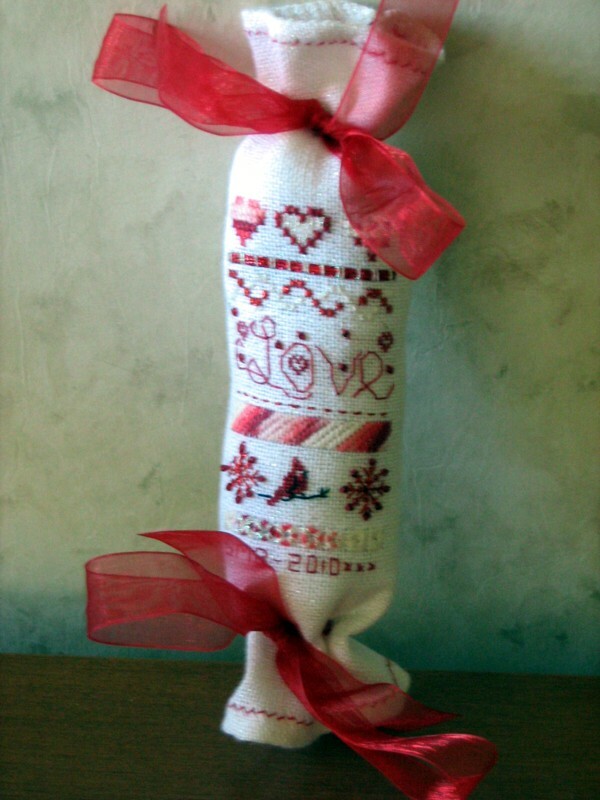 Then, this week, I finished the first project I did with Jeannette -- the "Love Needleroll", which was featured in the Just Cross Stitch Christmas magazine in 2004!!! 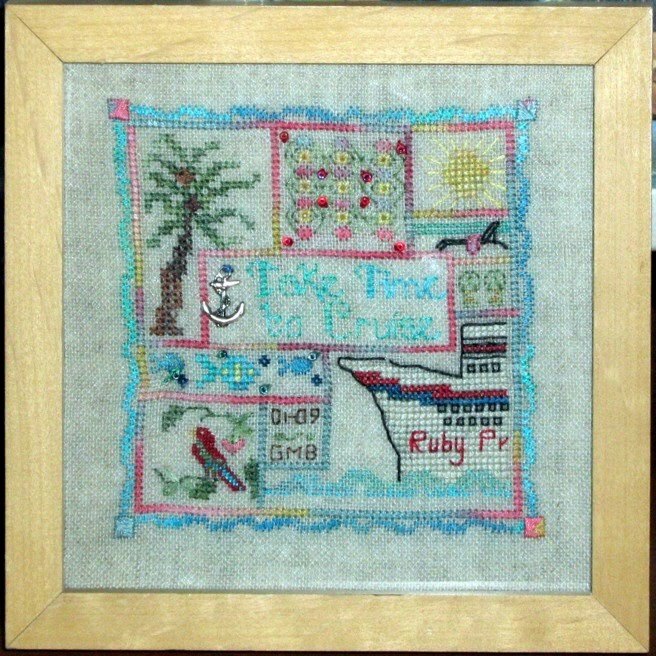 I've put it together and it rests on my buffet next to "Take Time to Cruise". It took me hours to do the pulled-thread work for the ribbon -- more time spent prevaricating than actually pulling the threads! -- but it was worth it. Now the weather is cooling off dramatically, and I, Like the Queen, am turning to knitting. I am well away on the marl of the cuff of the argyle kilt hose I've been commissioned to make, and my thoughts are turning to knitting and finishing items for Christmas. And then, just to kick my 50th Almost Fall Knitting Season off in fine fashion, I went shopping at The Crafty Lady in Lacombe when I was there on Monday. As soon as I got in, Lori was anxious to show me their new shipment from Berroco Yarns -- -- fabulous yarns, including the intriguing 'Remix', which I'd love to buy...but not yet -- and a new book from Nora Gaughan, Number 7, with which I fell in love immediately. Even better, it passed my "3 pattern rule", meaning that it had to contain at least 3 patterns I'd realistically make, before I'd lay out money for it. (Magazines have to do this too and, of late, few have passed muster -- but I digress.) I then spent some length of time -- nearly till closing -- looking for the right yarn with which to create at least one of the patterns: the Rhodocrosite Wrap, perhaps, or the Quarzo pullover. Alas, either the weight or the colour was wrong. Lori had brought in beautiful colours of the Berroco Alpaca in various weights, but all rather muted and with a great emphasis on greens, browns and golds, which do even less for my skin tones as I get older than they did when I was in my twenties. Sigh. All was not lost, however. I do, after all, have a capacious stash -- and I hadn't visited the steamer trunk in the back yard for some months. First, I went to the freezer on my back stoop, where I found an almost-forgotten bundle of balls of elann.com's "Endless Summer Collection" Lara in ruby tones (colour "#335 -- and no, it's no longer in production). Perfect for "Rhodocrosite"! Then, I went out to the trunk in the garage and there, in the bottom right hand corner, I found a package of 13 - 50 gram balls of Berroco Uxbridge Tweed in "Marionberry" -- Colour #1171 -- and yes, it's discontinued too. Such is the way of stash yarn. But "Marionberry" is a delicious mix of purples and blues, and will make a comfortable, even pretty "Quarzo". OOOO I went stash diving today too. Now I'm upstairs dustbunny chasing but later tonight I will knit a few more rounds of chunky alpaca/wool blend. Wonderful pieces...isn't it great to complete things?! 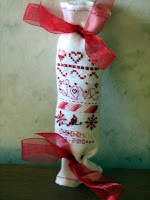 I love doing hand embroidery and cross stitch! 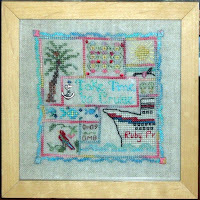 Your finished pieces are lovely! How wonderful it feels to finish projects that have been sitting around for awhile!